Want to win more Upwork clients? FREE spreadsheet. One of the few “easy” $50 projects I took on involved re-wording the verbiage in a sales letter. The client provided me a pre-written letter and just asked me to critique it and provide any necessary edits. I did this within an hour of work and felt good about my theoretical $50 hourly rate. Needless to say, I was surprised when I got an email from the client telling me they actually wanted me to totally re-write it. After about 5 different versions, my actual hourly rate on this project was only a few bucks. To top things off, the client left me a feedback slightly less than 5 stars. I was able to convince them to update the feedback score to 5 stars; however, it really steamed me. From that point forward, I became a little bit more skeptical about projects that seemed too good to be true. As you can see, the $50 project can do more damage than good. You really need to be aware of how efficient your prospecting and work habits are. If it takes you 30 minutes to apply to the job, an hour to win it, and two hours to complete the assignment, what was your actual hourly rate? These are all things you must be mindful of to achieve long-term success in the virtual workforce. Here’s a perfect example of a job posting I would never apply for. 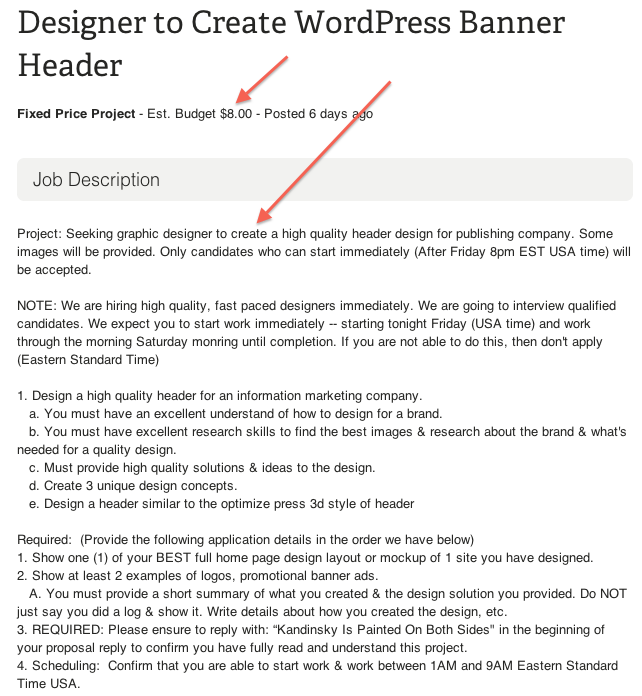 Notice the $8 budget and a job description that is absolutely frightening. Sometimes, no feedback is scarier than bad feedback. If you work in the virtual world, you already know that a positive feedback score is important to both clients and contractors. However, many newbies fail to consider this important axiom. Ask yourself this question, “Why does this person not have any Upwork feedback?” Without extensive conversations, it will be difficult to know for sure. By the time you’ve gone through the vetting process, you may have already spent too much time on a lost cause. This is why I never take on a client who has zero (or even limited) feedback. Like the previous red flag, if a prospective client has not spent any money (i.e. hired and paid someone) on Upwork, it’s an indicator to me that they are not worth my time. Now I realize that you have to get started somewhere. However, I’d argue that a wise contractor will let new Upwork clients get “acquainted” with other contractors. There are just too many unknowns when working with a company who has no experience hiring online workers. This one might be difficult to surmise simply by looking at a prospective client’s Upwork profile. I’ve been fooled by opportunities that seem like a good fit but turn out to be start ups with no cash flow. Now I’m not saying you shouldn’t consider working with a start up. I’m sure there are contractors who made millions (if not billions) because they got in at the ground level when Zuckerberg and the boys started Facebook. However, for every Facebook there are probably 100 or 1,000 flops. A flop means you don’t get paid. Therefore, I only work with companies that have a proven revenue stream and aren’t going to nickel and dime me for every second of my time. So how do you find out if a company has a reliable revenue stream? I suppose it depends on the role you’re interviewing for. Virtually every interview I’ve ever participated in allows the interviewee to ask a few questions. This is a great opportunity to dig deeper into the client’s business model. Here are a few probing questions I have asked before. I’ve highlighted the words that help you dig deeper. What type of clients or industries do you currently serve? What are some challenges that your clients routinely deal with? How many team members do you currently have? What sales and marketing strategies have you implemented in the past? I’m not sure if I’ll be able to explain this one to my satisfaction. All I can really say here is trust your gut. If the conversation is giving you a weird vibe, you may want to re-consider working for that client. Here are a few experiences I’ve had to deal with that set off warning bells. The prospect refuses to have a phone conversation and will only communicate via instant messenger. When the topic of money comes up, the prospect tries to pressure you into working for free until they are able to get more sales in the pipeline (refer back to red flag #3). The client wants you to begin working immediately without hiring you to an Upwork contract or making a deposit. The prospect makes references to things that are either illegal or immoral. During the interview, the prospect uses profanity or makes unprofessional comments. It was nice to connect with you yesterday. I appreciate your time and thank you for your interest in having me join your team. Unfortunately, I will not be able to accept your proposed offer. After reviewing your company’s needs and my skill sets, I think it would be best if you find a different candidate for the position. Thank you again for your consideration. Keep it simple and get to the point. In most cases, you may not hear anything back. Sometimes, the prospect will try to convince you to reconsider. It is important that you stand firm and trust your gut. If it isn’t a good fit, there is no point in trying to force it. There are plenty of other job opportunities on Upwork and other virtual marketplaces. Want Better Upwork Clients? Check This Out. Death of a Close Talker? The good article for the contractor to ahead his/her way. I have enjoyed this article. Keep posting. Wow…Really excellent post, it’s a very important issue for every oDesker. 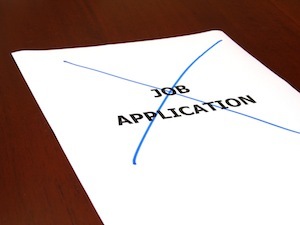 Also consider other applicants and average price of a categorey where you are going to apply for a job. Thank you for your post. I have been through all of these bad experiences and wasted my time working without paying attention to my feedback score. It became low because of these clients. For example, there was one bad experience with a long term client who wanted me to work outside oDesk. I did not agree and he was mad at me and gave me a low feedback. Report the client to ODesk. It’s a breach of contract and Odesk will block that client from hiring again. And they will remove the bad rating by the bad client. This is a great article. I’m a new user to oDesk, and have been shocked at some of the large requests with tiny budgets. I was about to toss oDesk out the window as a professional resource for contractors, but I’m learning more and more about how to sift through the garbage to find the real work. I’m sure it’s the same for clients; you have to go through the contractor’s profile, portfolio and learn about them to gauge whether or not they are in fact talented and experienced. Great article Matt. I’ve been working in odesk for about 3 years, and yeah, originally I didn’t accept job proposals with clients with no feedback, no hours, due to problems I had with them before. But recently, I’ve worked with some of those types of clients, and in general, had good experiences with them (not all). I due have another suggestion to add, never work with a client in which you have communications issues. I have accepted about 3 times jobs from clients that can’t speak or write well, so I end up doing something that they didn’t want, or I spend lots of times trying to “decode” what they need. I understand some clients are from other countries and can’t speak english well, so they decide to do the interview in chat. But when you even have problems with understanding them in chat, that should probably be a Red Flag. Yes, this happens to me.